Due to the nature of this blog, I write about all my experiences: the good, the bad and the bubbly. While I don’t consider my reviews the final word on any bar, I do try to maintain the credibility of my personal impressions. To do that, I stick to my own opinion, take a deep breath, and hit ‘publish’ without stressing that it won’t please everyone. One of the uncomfortable consequences of this is that sometimes I hear back from bar owners who aren’t so pleased with my impressions. Which brings me to a recent mail from the owner of Jefrey’s, also a reader of 52 Martinis, who got in touch after my recent review. I don’t intentionally set out to make anyone feel bad, so I appreciated his attitude that critics can push one to improve and happily accepted his invitation to come for the launch of their new cocktail menu and DIY Martini. On the night of the launch party, I chatted with the friendly owners who are admittedly beginners but passionate about creating a welcoming environment and a great bar. Granted, it’s tough to judge a place when the drinks are free and party atmosphere is buzzing, but I think they’re making conscientious steps towards stepping up their game. 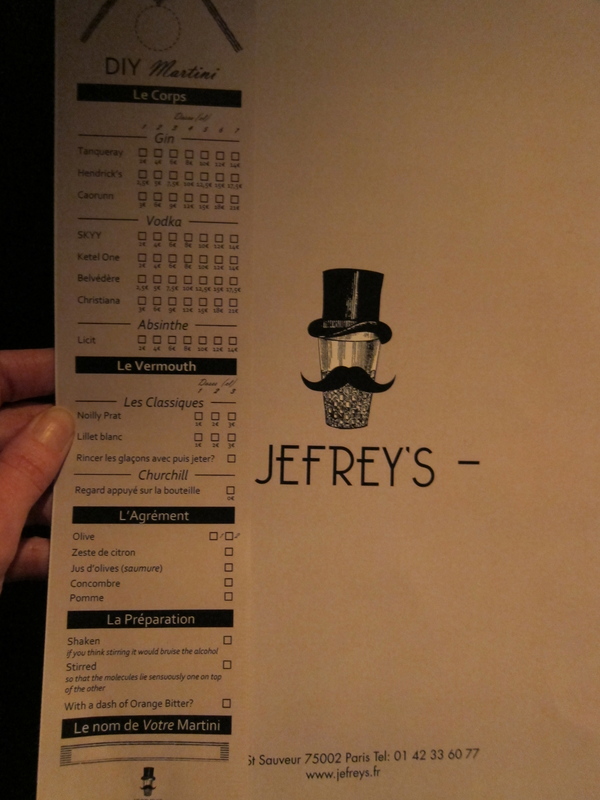 First off, the menu prices seem to have dropped slightly so they are more in line with other spots on the street and we’re seeing fewer sweet and more sophisticated options, like the Jefrey’s sazerac. While the menu still has plenty to please those who go the cosmo route, there are now more options for something a bit saucier. Of particular interest to me, is their DIY Martini. 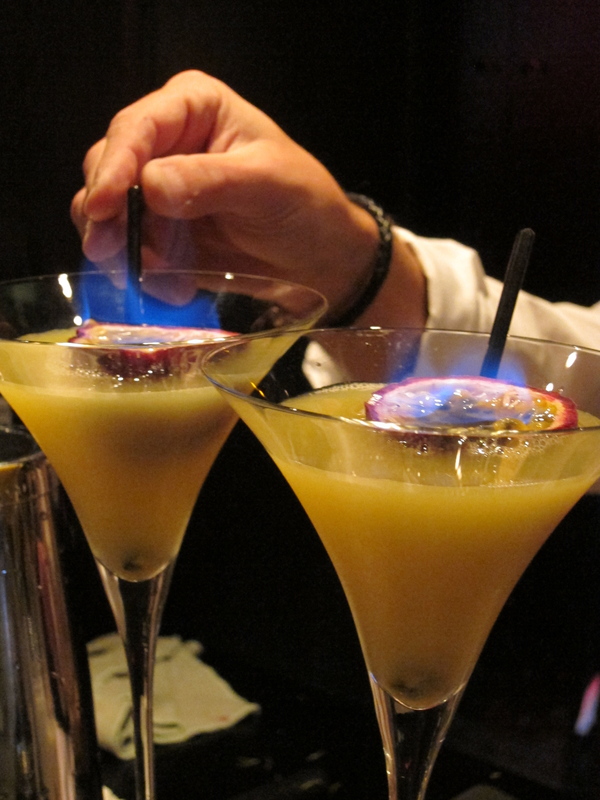 Customers create bespoke martinis using a printed checklist to choose brand and dosage of spirits, garnish, preparation and extras like a dash of orange bitters. A box at the bottom of the form allows you to fill in the name your creation. Of course, I could always go into a bar and simply tell them how I want my martini, but not everyone is a fanatic and might not know how to order what they want. This method gives those that are less familiar with the makings of a martini the confidence to choose and the opportunity to learn a bit more about the king of cocktails. 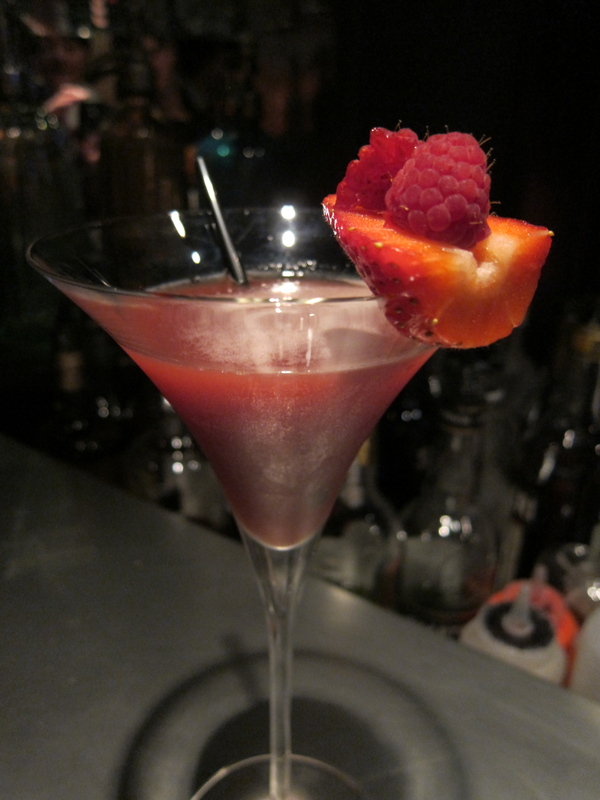 This method also allows more control over the size and cost of the martini as the price is based on dosage. For example, a centiliter of Tanqueray is 2 Euros. So, you build your martini to size, which is reflected in the end price. Martini-virgins can sample a small one or curious cocktillians can try several variations without emptying their wallets or falling off the barstools. I skipped over the vodka choices (SKYY, Ketel One, Belvedere and Christiana) and went straight for the gin with a stirred 1 to 4 part Noilly Prat and Tanqueray martini with a twist. While I’d love to see more choices of gin, their selection of three works. Tanqueray provides a classic choice, Hendrick’s ups their trendy cocktail cred, and Caorunn gives a taste of something not found in most Paris bars. So, kudos to Jefrey’s for working towards bigger and better things. Just as I can’t please every reader, no bar can please every drinker. But, I’m not in the business of selling drinks, so I do respect those who are for making the effort. What Cheese Pairs Best with a Sazerac Cocktail? February 11, 2019 Forest Collins cheese pairings, Uncategorized Comments Off on What Cheese Pairs Best with a Sazerac Cocktail? And kudos to you for doing an update!! It can take a lot to revisit a place. When I read your first review, I decided no longer to check out this bar – as there are so many other great places in Paris. But now, after your update, I might just pop in for a drink to check it out. I’m always looking for new cocktail places in this city of wine. well, thanks! It’s true…there really are a lot more good options now, which makes it hard even to get to places regularly that I love. But, I know some of my posts are getting a bit out of date, so I’ll be making an effort to update the backlog when and where necessary. if you do pop back in here, let us know what you think. Maybe I can help you about that. I love the very much,last day i purchased two pairs of uggs and some nice from a shop,for my onipion,their boots have awesome quality and nice price for everyone,i think it maybe good for you.Good luck to you! very poplar and fashion for you.